The American Journal of Preventive Medicine published a new study looking at the costs associated with a United States requirement that folic acid (a B vitamin) be added to all cereal grain products labeled as enriched (also called folic acid fortification). 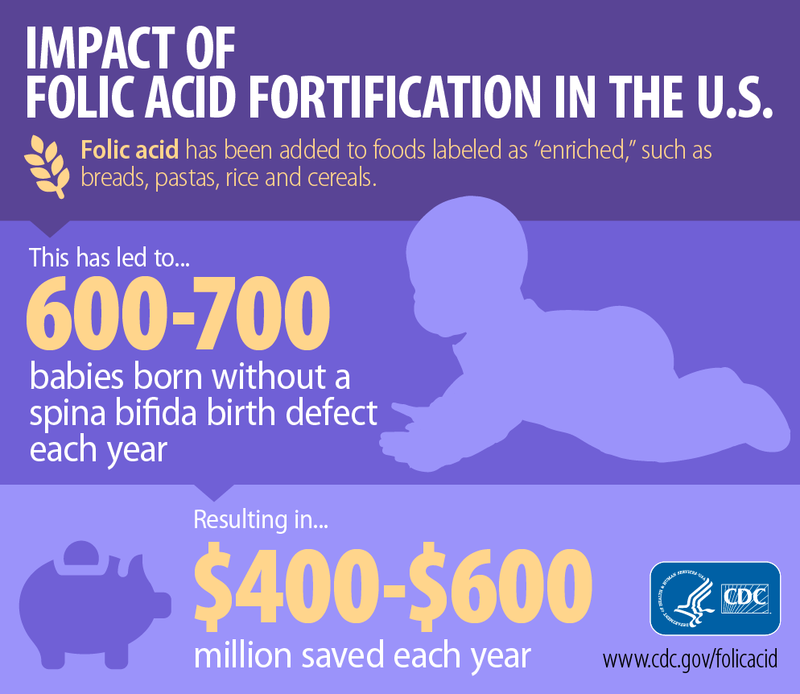 In this study, CDC researchers found that after folic acid fortification, an estimated 600-700 babies are born each year without spina bifida (a severe birth defect of the spine), who would have otherwise been affected were it not for fortification. They also estimated that the amount of money saved as a result of the fortification policy (also called cost savings) is around $400 million to $600 million dollars every year in the United States. These estimates can be useful to decision makers in other countries who are considering folic acid fortification. To learn more, we invite you to read a summary of the key findings or read the abstract of the article. Spread the word! We encourage you to share these links with your colleagues and friends. Feel free to post them on your own home page as well. CDC’s National Center on Birth Defects and Developmental Disabilities is committed to identifying the causes of birth defects, finding opportunities to prevent them, and improving the health of those living with birth defects. On behalf of CDC, we thank you for your continued support and your promotion of CDC’s activities related to birth defects.